Israel's Sharon Fights For Life, But Doctors 'Pessimistic' : The Two-Way The head of the hospital where Ariel Sharon is being treated says the former Israeli prime minister is "fighting like a lion," but his condition is still critical. The 85-year-old has been in a coma since suffering a stroke in 2006. 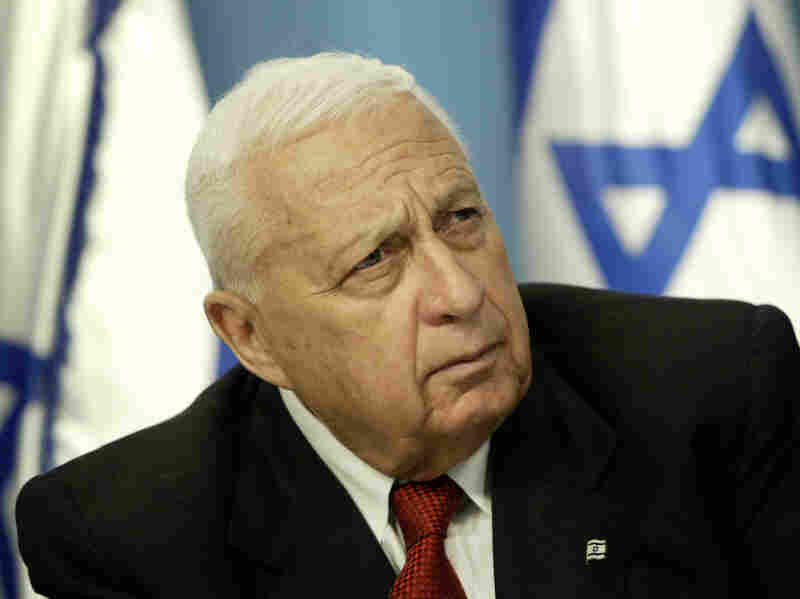 The outlook for Ariel Sharon's survival is "pessimistic," but the former Israeli prime minister is "fighting like a lion." That's according to Dr. Zeev Rotstein, the head of the Chaim Sheba Medical Center near Tel Aviv where Sharon is being treated. At a news conference this weekend, Rotstein said Sharon's condition was still critical, and that his organs weren't functioning. But, he added, doctors had stabilized the former leader's blood pressure and pulse. "As of now, his family and children are by his side, and we are continuing to treat him as before," he said. "His organs haven't resumed function — and I'm not sure if we've improved the situation in his kidneys. We're treating him with lots of love and support, but there's not much we can do." As Mark reported last week, the 85-year-old Sharon, who has been in a coma since suffering a stroke in 2006, was now suffering additional health problems. Israeli media say his "days are numbered." "Sharon was born in 1928 in what was then Palestine under the British mandate. His parents, Shmuel and Devorah Scheinerman, had been Jewish immigrants from Russia after World War I. "In 1973 he went into politics when it became clear that he would never be made chief of staff of the Israeli army. He was a founding member of the Likud, the right-wing party whose leader, Menachem Begin, was elected prime minister in 1977. "Sharon became defense minister in 1981. ... In 1982, he led the invasion of Lebanon. ... Soon Israeli forces pressed all the way to Beirut, and set siege to the Lebanese capital. ... The Lebanon war ended with one of the bloodiest incidents in the contemporary history of the Middle East. Lebanese Christian forces, allies of Israel, attacked the Sabra and Shatila refugee camps in Beirut and massacred hundreds of Palestinians, including women and children, while Israeli officers looked on. "Sharon proclaimed his innocence, but a commission of inquiry in Israel later found him indirectly responsible and prohibited him from ever again holding the post of defense minister. "In a 1983 interview with NPR, Sharon expressed regret about the massacre. "After these events, Sharon found himself in the political wilderness. He did not play a prominent role again in politics until the late 1990s, when he returned to government under Prime Minister Benjamin Netanyahu. "So he decided to move unilaterally, and in August 2005, he ordered the withdrawal of all Israeli settlers and soldiers from Gaza. "He also began construction of a barrier in and around the West Bank, which is still under construction. "In the last days before his stroke, Sharon created the impression that he was searching for a way to make peace with the Palestinians, but only on his terms."